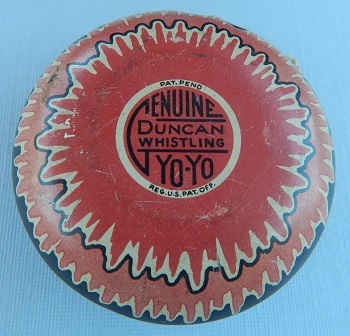 A tin Genuine Duncan Whistling Yo-Yo, three-color flower design, from the early 1930s. Note the "PAT. PEND." designation above the logo and "REG. U.S. PAT OFF." below the logo. A beautiful and elusive model. Original retail price: 15 cents US.